Alcove & Agapes puts the accent on a welcome both personal and cultural. 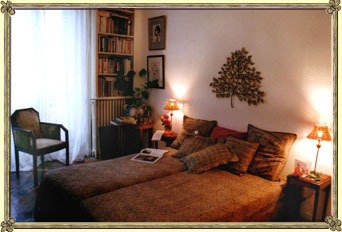 The Home stay, called chambre d'hôtes or chambre chez l'habitant in France, Bed & Breakfast in the english spoken countries, Couette & Café in Québec, Zimmer Frei in Germany... is a private bed room offered by a private person, in his familly home,to a foreign guest (Tourist, Businessman, studient...). All homes on the Alcôve & Agapes roster were selected by Françoise FORET, for their qualities of comfort and tidiness, pleasing surroundings, and the warmth and friendly personalities of their hosts. Alcôve & Agapes ' Bed & Breakfast is a means by which travelers can partake of our extensive research based on : Authentic French Culture, Personal relationships, Originality and of course Good Value for money. Technological progress and automation made life easier but evaporated the touch and feel of actual human contact. What humankind needs more and more today are real personal exchanges. Each of Alcôve & Agapes's b&b locations present to you warm-hearted people and affordable accommodations which offer more congeniality than that found in a hotel. Each location exudes an atmosphere in which both guest and host can best enjoy a sense of camraderie and fellowship. Travelers who hail from both near and far are welcomed as friends into the homes of real Parisians. With the assurance to receive any kind of assistance needed from their host regarding the many wonders of Paris, guests also enjoy the freedom to come and go as they please.